Let’s rewind back a few months and make this make a little more sense. Back in 2008, I taught 6th grade for a rural, private, Christian school. I learned a newfound respect for teaching (it’s a calling, not a job), parenting (because bad parenting ruins children, teachers, and everyone), and personal poverty (another post for another day). To dwell on the positives: they were all nice enough not to tell me that I wasn’t a very good teacher. I did happen to be a fairly good entertainer – whether juggling, jabbering Icelandic, or other parlor tricks. That earned me a little bit of popularity (which I would have happily traded for better discipline or more food). Teaching means field trips. 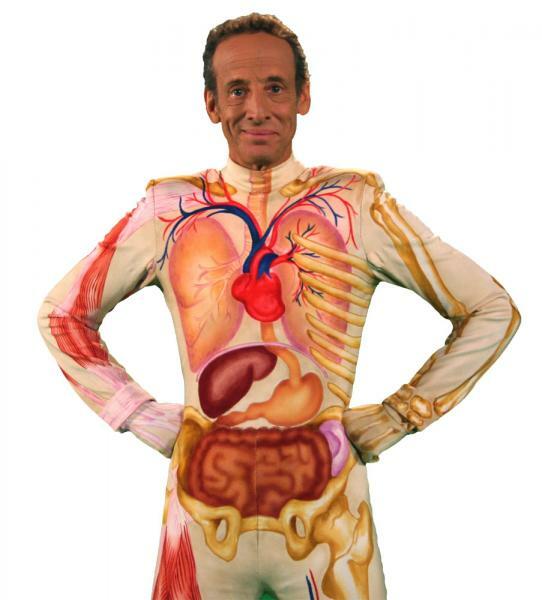 This particular trip we all massed to a Slim Goodbody event, a cute little educational show where Mr. Goodbody sings, dances, and teaches kids all about the body’s innards. You would think an autopsy would do the job better, but jiggling the cadaver into a macabre dance routine doesn’t quite work. There were at least a dozen other elementary schools packed into this coliseum, starving for amusement. I sat with the teachers, hoping to grouse, catch a nap, and let Slim entertain the kids, all four hundred of them. Sadly, none of the grade schoolers brave enough to take the stage could muster anything more than a somersault or a cartwheel. A total farce, trav-sham-mockery, and patently embarrassing. No specials here. Slim had had enough. We teachers had pretty much checked out by now. So had Slim. To cap the misery off, he then offered a giveaway, a CD featuring all his greatest hits, like Your Body’s Just as Ugly on the Inside, The Funny Bone Connects to the ‘Shut Your Mouth’ Bone and Here’s Why a Kidney Punch Could Kill You. I remember hearing him ask the teachers for a volunteer to come on stage and collect, perhaps to see who was still paying attention. Seemed simple enough, and I’m sure it’d have been good exercise. I wasn’t interested. But my students — they were. They started chanting my name, the little barbarians. What began among just my 6th graders soon spread to all the grades at my school. And inexplicably, once the other elementarians learned my name, they too joined the chant of MIS-TER HAN-SEN, MIS-TER HAN-SEN! Fine, fine, I’ll get on this dang stage and collect. Someone had to. And that’s when Slim asked me. Crap. Crapcrapcrap. I’d been tricked. He was still hosting “America’s Most Amazing Bodies” and I’d totally missed that. If you’ve seen me, you know I’m not remarkable. It’s a stretch to say I’m even single-jointed. Talk about body-shaming: I was about to experience a grand humiliation on account of my normal figure. The gremlin crowd continued unabated, their roars only barely ceasing. They wanted blood. Or at least something that wasn’t an aborted cartwheel. The arm trick? The — ohmygod the arm trick. YES. It’s nifty, and I needed something to distract my class before recess or something. Did it once, and that was that. That arm trick — thank you Ethan. I could never keep you quiet in class, and I’m glad I couldn’t. I had everything ready for the trick on hand, and there in front of a strung-out crowd of hundreds of children and dozens of checked-out educators, I “twisted” my arm a full 360º, screaming in agony for effect. The kids, mine and everyone else’s, lost their collective poopy. The teachers? Their reactions ranged from skeptical shock, septic shock, dry heaving, and plenty of congratulations as I made my way out. Thank you, Ethan, for being a loud kid. Sure, it lost you a lot of recess, but it saved your teacher’s day. And thank you, Mr. David Blaine. You gave me a wonderful trick up my sleeve (literally). I never did get that Slim Goodbody CD. Next ›What’s Next After Sriracha?